Cats conquered the (ancient) world long before they conquered the Internet, reports a paper published this week in Nature Ecology & Evolution. The DNA analysis of over 200 cats spanning the last 9000 years reveals the spread of cats from the Neolithic onwards. Cats were domesticated relatively late in comparison to dogs, living alongside humans for thousands of years prior to the onset of domestication, most likely in a mutually beneficial relationship by preying on agricultural pests. 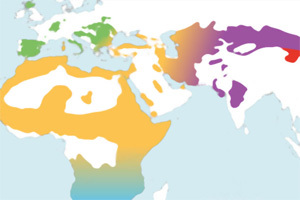 Prof. Nikolai Spassov (National Museum of Natural History at the Bulgarian Academy of Sciences) and colleagues compiled and sequenced DNA from archaeological and historical cat remains, including Egyptian cat mummies and modern African wildcat specimens. They find that two major lineages of cat contributed to today's domestic cat. One, IV-A, first appeared in southwest Asia, and then spread into Europe as early as 4400 BC. By contrast, a lineage of African cats called IV-C dominated Egypt, and constitutes the majority of Egyptian cat mummies. The authors find that lineage IV-C then spread throughout the Mediterranean along trade routes in the first millennium BC. Having arrived in these locations, introduced cats mingled with local tame or wild cats, leading to hybridisation.